Low back pain is a very common condition seen by a chiropractor, and manifests as pain and/or stiffness in the low back region, which often includes not just the lumbar region, but also the back of the pelvis as well (see pictures). 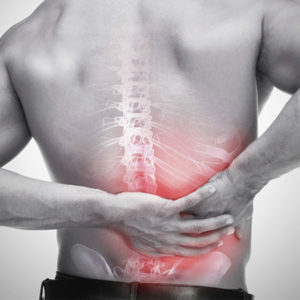 Low back pain is said to affect roughly 80% of people at some point in their lives. Because the nerves which exit the spine at these levels are responsible for the legs, people often get associated buttock and leg pain, numbness or tingling in these areas. Sciatica is also a common associated complaint. There are many causes of low back pain, and not all of these are treatable by a chiropractor. In general, chiropractors treat mechanical causes of back pain, and will refer you for treatment elsewhere for non-mechanical causes. Mechanical causes are lead by what a person does with their spine. Our jobs, the way we sit, stand, lift, walk, drive or sleep can easily affect the muscles and joints of the low back, especially over time. Before your visit, you are quite likely to be unaware of the cause of your pain. That’s fine! your chiropractor will be very happy to help you work out what sort of low back pain you have and point you in the right direction for treatment. Chiropractic is a proven effective treatment for both acute and chronic (short and long term) low back pain. If you are interested to learn more, see this 2010 Bronfort report. As mentioned above, movement is the most important function of your back and provided they are not painful, some simple low back exercises can work wonders in improving range of motion, symmetry of muscle and general spinal alignment. Your chiropractor will almost always give you some of these exercises to strengthen your back and speed up the healing process. Please do not undergo any exercise regime without first consulting either your chiropractor or another primary healthcare professional, particularly if you have an undiagnosed problem. Although low back pain can be painful, debilitating and sometimes even depressing, there are many things that can be done to improve the condition. Chiropractic is one of the most effective solutions and has even been found to save the most money compared with medical care! The earlier you get started on the healing process, the better your outcome is likely to be, so book a first treatment as soon as possible! Chiropractic, and other manual therapy are suggested in the NICE guidelines as well.